Without the usual television cameras, US President George Bush has vetoed a bill that was to expand a children's health insurance program. What the press avoids to mention in their reporting of the event however, is that the bill contained an important passage that would have mandated the elimination of toxic mercury from flu vaccines, a development sharply opposed by pharmaceutical companies. Thiomersal, the mercury compound used as a preservative in many vaccines has been quietly phased out in Europe, and in many of the vaccines used in the US (flu vaccines still contain it), but the situation is different in developing countries. Even vaccines that are thiomersal-free in the West, still contain the toxin when produced for export to developing countries in Africa, Asia or South America. The presence of mercury allows substantial savings for pharmaceutical companies but it has been fingered as the cause of an autism explosion. Autism was a practically unknown affliction some decades back, but now one in every 150 children is affected. The change happened in the last few decades, coinciding with an almost uncontrolled proliferation of vaccines on the childhood 'vaccination schedule'. Mercury - Relax! Illustration by Emma Holister. It is not uncommon for toddlers to be given dozens of vaccines before they can even walk. Dr. Sherri J. Tenpenny says that "children are contaminated with up to 51 vaccine antigens by the time they are six months of age. If they receive all doses of all recommended vaccines, including annual flu shots and boosters for MMR and chickenpox, that number skyrockets to 113 by the time that they enter school." Vaccination is a large and growing business for pharmaceutical manufacturers. Perhaps President Bush's veto did have something to do with protecting those profits. After all, the pharmaceutical drug lobby is one of the largest political campaign contributors - to legislators of both parties in Washington. Question: Why should we care when we read in the papers that mercury has no relation to the development of autism? When even Wikipedia's article on autism says there is "no evidence" that autism is the result of a poisoned nervous system? Well, there are indications that the authorities - including Wikipedia - may be wrong on that count. Some time ago, the Amish were in the news. They generally refuse to vaccinate their children and lo and behold, there are next to no cases of autism among the Amish. In a follow-up to Dan Olmsted's story of the Amish, J.B. Handley of Generation Rescue reports on a small, privately financed study that showed vaccinated kids to be at a higher risk for developing autism than those who haven't got the shots. 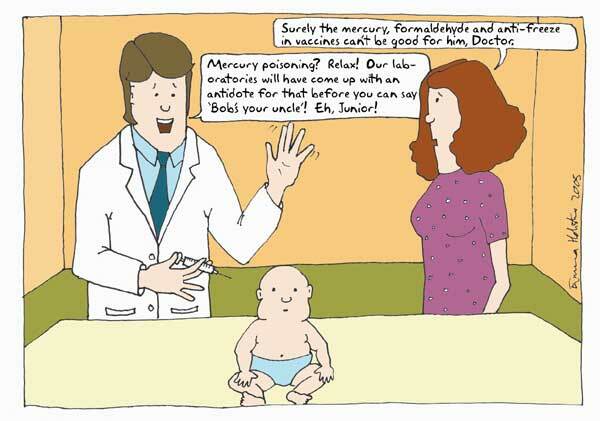 We might ask why the CDC has not initiated a study of vaccinated vs. unvaccinated children, but then - it appears that the CDC may habe known already back in 2000 that mercury in vaccines causes autism but has failed to take decisive action. "For the past several years there has been a raging controversy as to whether or not mercury in medicines, especially in vaccines, has caused a dramatic rise in the rate of children diagnosed with an ASD. Many experts have insisted ASDs are caused by some yet-to-be-identified genetic cause. A paper recently published in Nature Genetics described the results of multi-million-dollar genetics study (which studied a thousand-plus families with at least two children diagnosed with an ASD using in-depth genetic screening). Tellingly, the authors reported, “None of our linkage results can be interpreted as ‘statistically significant’...” (The Autism Genome Project Consortium 2007). With the current study’s results, public health officials should now publicly admit what they have been saying in their private transcripts and memos: Mercury from Thimerosal-containing vaccines and other medicines has been a major cause of ASD cases, which, based on recent CDC estimates (CDC 2007), may, when corrected for under ascertainment, exceed a rate of one in 100 children." • Ban the production and distribution of medicines containing added mercury in the United States, unless proven safe (“sufficiently nontoxic...”) and no mercury-free alternative exists?" What will have to happen for the press to report both sides of the debate and the government agencies to take action to limit exposure to mercury and other toxins - fluoride comes to mind - so as to protect people's health? Certainly the veto on a bill that would have limited mercury in at least one type of vaccine is giving the wrong signal. It appears to be saying "go right ahead using the stuff - who cares!" In any case, if according to the CDC, the ASD prevalence rate was 1 in 150 on average among children born in 1994 and if the number of 6 year-old children with ASD known to the U.S. Department of Education indeed increased by 124% nationwide over the last six school years, then it is likely that among children born in 2000 who are now registered in U.S. schools, the prevalence rate of autistic spectral disorders is around 1 in 67, on average. Now that would be a catastrophe of unprecedented proportions. Since the CDC 2002 study results were released in early 2007, no one in authority has bothered to correct the false impression that the "new" prevalence was current. Every day tens of newspaper articles and news items discuss the alarming increase in autism "that has now reached 1 in 150" and promptly reassure people that it is not related to vaccines and a mercury preservative. It will be interesting to see when the head of the CDC's autism program will reveal to the Nation that the prevalence of autism and other spectral disorders is really more than double that estimate.